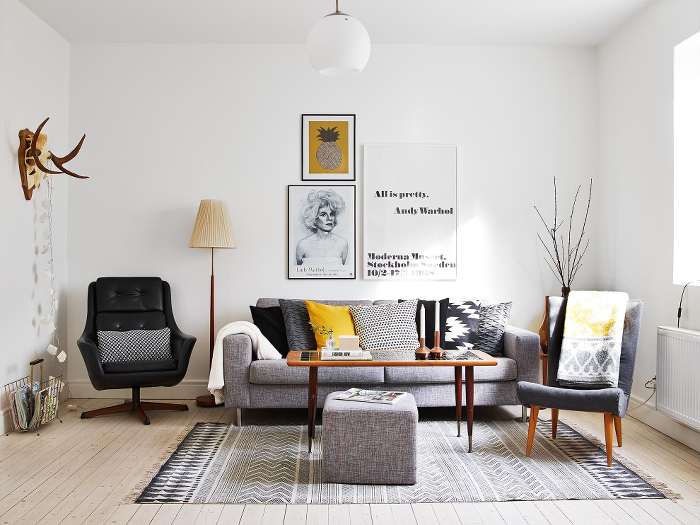 Stylish Scandinavian Decor can easily be acheived in six easy steps. Zoe Clark, will take you step by step on how to complete a Scandinavian look. With the winter glum already surging over the northern hemisphere, it is the perfect moment to cozy up your home with a few snug details borrowed from the Scandinavian décor. Northerners are well-known for their charming interior design, and their main decorative style relies heavily on the use of natural materials, preference for neutral and light tones, clean lines, subtle elegance and peerless combination of aesthetics and functionality. Here are some of the principal features which you can steal from the Scandinavian décor in order to add a note of comfort and refinement to your own home. If you have wall-to-wall carpeting in your rooms, you will need to pull it back if you want to achieve a true Scandi look. Despite the harsh climate, large rugs and carpets never really gained wide popularity in Scandinavian countries, ands northerners still prefer their chic wooden floors (usually made from either pine or birch) to be exposed and coated with a light varnish. For a Scandinavian wall number, opt for light, neutral or muted tones. Because of the dreary climate, lack of bright sunlight and freezing temperatures in wintertime, homeowners in Northern Europe are fond of luminous ambiances and they often use white, beige and light cream to amplify the visual benefits of natural light in their homes. Believe it or not, sometimes they even paint the floors white to maximize luminosity effects indoors! When it comes to choice of colors in furnishings and accessories, Scandinavians often use neutrals, white and light tones to additionally boost the use of natural light during long winter months. Most Nordic homes feature brilliant white or light beige furniture brightened up by a few vivid extras in navy blue, red or duck green such as lamps, sofa covers and cushions. If you want to max out the Scandi look in your home, go after neutral, radiant tones rather than solids (you can use the latter sparingly as accents or minimal contrasts). As far as materials are concerned, people living in the northernmost part of Europe love to bring the outdoors in and make the most of natural elements such as wood, stone, linen, wool and cotton. If you cannot invest in rustic furnishings or all-wood flooring, you can use various natural fabrics such as cotton string and wool (which you can find in most yarn shops at an affordable price) to make cushion or stool covers, knitted blankets and a host of decorative tidbits to liven up your home with a touch of Scandi warmth. 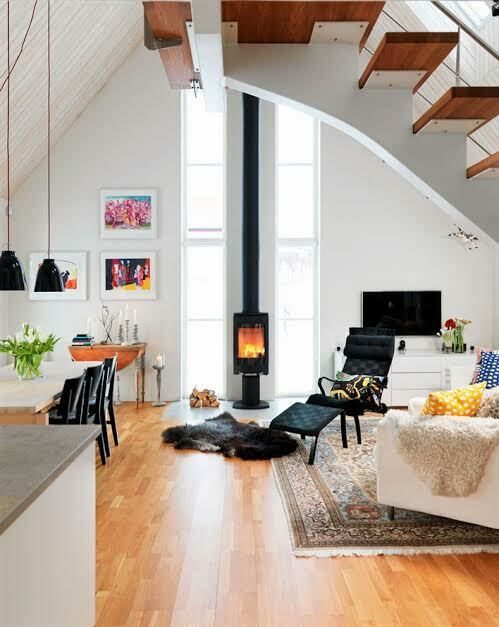 A fireplace occupies an important place in the Scandinavian home because of its association with warmth and comfort, which are highly valued assets in the regions plagued by chilly Nordic climate. If you have a mantelpiece in your living room, use it to your Scandi style advantage: clear away the useless clutter around the fireplace, clean charred surfaces and add a few chic accessories such as engraved fire glass, ceramic figurines and a chessboard. Scandinavian homeowners are not lovers of sheer aesthetics, and they prefer minimalist decors and functional elements to lavish ornaments and items with little or no practical value. To create a Scandi atmosphere, pare down your home décor and opt for accessories that are both useful and charming, such as woolen throws, clean-lined chandeliers, large mirrors, authentic artwork and light-colored beanbags. With a careful selection of colors, extensive use of natural materials and a handful of cozy accessories, your living area can easily go from scratch to Scandi. Off with the Christmas blues: it is time to brave cold weather and snowy evenings with a mug of mulled wine, gripping books and the stylish Nordic décor. Winter has come, after all. For assistance with any style decor, contact All About Interiors for a private consultation. A huge thank you to Zoe Clark for her wonderful insight into Scandinavian design.